SABR sells and distributes Loftware Print Server	Premier Edition (LPS Premier Edition) for Barcode Label printing and RFID encoding. Detailed Print Status – Providing the ability to know exactly which labels have printed, and real time printer status. This Version can provide detailed information about the status of the printers so you know exactly how they are performing. ZPL2, IPL, and FingerPrint/Direct Protocol printer languages are supported. LPS Data Reporting Tool – Need to know which fields are being used by your label templates? Want to search your labels to see what images are being used? 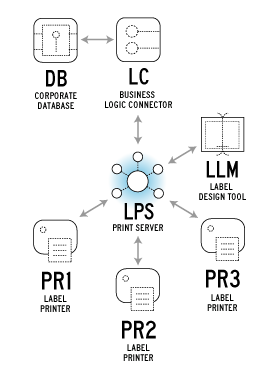 The LPS Data Reporting Tool can provide a rich set of information on your labels, templates, symbologies, printers, and system configuration. SMTP Support for LPS Notification Agent – Do you need to know when your printer runs out of stock? Do you want to be notified when one of your printers goes down? The LPS Notification agent is a configurable event-based notification system that now supports sending email notifications using SMTP.